The Football Index have finally announced that on 26th March 2019, all existing shares, or futures, will be split by a denomination of 3. It had widely been rumoured/anticipated that the split would be by at least a denomination of 4, but the Football Index appear to have adopted a slightly more cautious approach and decided to go with a 3-way split. If you are a Football Index trader and haven’t been living under a rock for the past few months, then by now you will be fully appraised of what this means for your portfolio going forward. However, for those of you reading this who have only just crawled out from underneath the rock where you were residing, in summary this means that if you have 10 shares worth £3 each = £30 pre-split, from 26/03/2019 you will have 30 shares worth £1 = £30 post-split. The general thinking amongst most traders was that rather than reduce the media and performance dividend pay-outs by the same denomination as the split on the shares, thus keeping the amount of dividends that could be won on existing shares at exactly the same level, that the Football Index would offer ‘increased’ dividend pay-out’s to try and increase liquidity into the market. The Football Index did indeed announce that the dividends would be ‘increased’, which, whilst I am not complaining about as an existing shareholder, if I am honest I was a little underwhelmed by the increases. Below is the new dividend table which will come into place from 26/03/2019. On the face of it, the dividends do not look that enticing, although it is important to remember that all the existing share prices will be reduced by 2/3rds of what they are now. I imagine existing shareholders of any of the players who are consistently in the mix for dividends, e.g Pogba, Messi, Neymar etc will be licking their lips at the new dividend structure. To explain why by an example, if you held 100 shares in Messi prior to the share split, the maximum dividends you could win on a Treble Match Day would be 23p per share, so a total dividend win of £23.00. This would be made up from a 12p per share dividend for being the top forward, a 6p per share dividend for the overall star player and a 5p per share dividend for the Media winner. 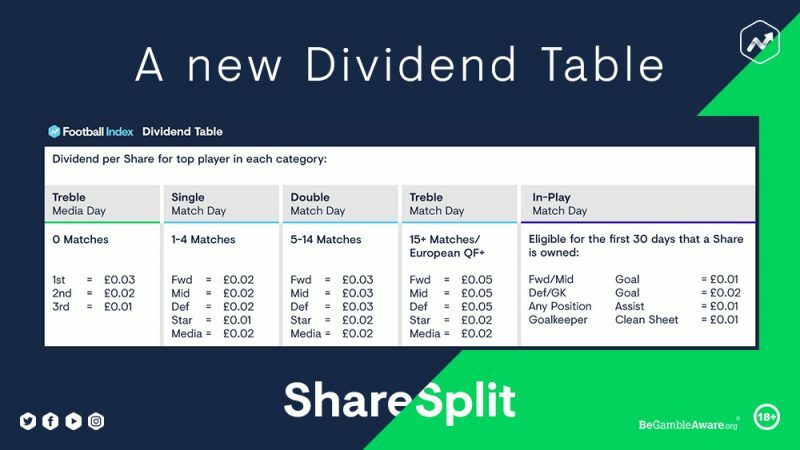 Under the new dividend structure, the maximum dividends you could win on a Treble Match Day would be 9p per share. However, you would now have 300 shares eligible to win dividends and so the total dividend win would now be £27.00. Does this mean that it is better to buy shares in players now before the share split, or wait until after the share split when the prices will have been split by 3? If you haven’t worked it out already, buying the shares before or after the share split makes no actual difference to how much you would recover in terms of dividends. If we use Messi as an example, he is currently trading at around £17.60 pre share split. Therefore, 100 shares would currently set you back £1,760.00. Post share split, the same level of investment would now get you 300 shares, but the dividend pay-outs have been reduced so you are no better or worse off. You may be thinking, based on the above, what exactly is the point of the share split then? Well, in a nutshell, it is to increase liquidity into the market and make more players affordable for more traders and thus making the Football Index more accessible to more people, which can only be a good thing. The initial market reaction has been to remove money from youngsters with potential and re-invest in established dividend winners such as Messi and Neymar. This may be an excellent strategy, but I predict that it won’t be too long before people get tired and frustrated of waiting ages to win a few pence in dividends, and then look to make profit via capital appreciation in young and cheap wonderkids ready to become the next Messi or Neymar (which has pretty much been the ‘go-to’ strategy on the Index since the implementation of the goal/assist dividends). Redzone extend range with Glory Goals to offer cash bonuses on top of winnings for new low margin offering.